The Heart of the Clan Hannay: Your Home. Sorbie Tower was built in the 16th century for Alexander Hannay of Sorbie, adjacent to a 12th century motte, on a raised site protected by surrounding marshland. In the 17th century the Stewarts of Garlies took possession of the castle, and the last occupant was Brigadier-General John Stewart who died in 1748. 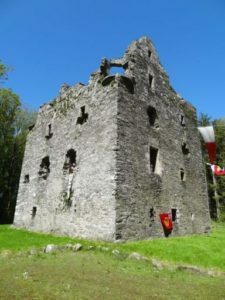 The castle became ruinous and was donated to the Clan Hannay Society by Mrs Jean Cummins in 1965. Over the next 35 years the clan spent about £40,000 conserving the ruin, but it became dangerous and required scaffolding. In 1972 the building was listed Grade A by Historic Scotland. In 2001 and again in 2005, successful bids (for £77,000 and £50,000 respectively ) were made to the Heritage Lottery Fund, with partnership funding from Clan Hannay and Historic Scotland . This enabled scaffolding to be erected to make good the wall heads, consolidate the stairwell, repair some of the lime mortar, and put a floor over the ground floor vaulting. In 2007 the surrounding woods were cut back, and in 2010 Historic Scotland agreed to put the tower on the register of castles and towers suitable for restoration.